« “Britain should leave the EU on WTO terms” – the Story Behind the Communist Party of Britain’s Call. 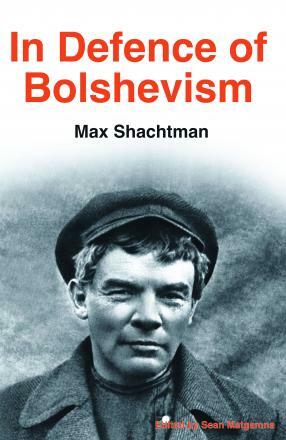 It is all very well defending the Bolsheviks by quoting Marx and Lenin, a bigger question arises whether the Bolsheviks can be defended after the relentless attacks on their activities by those such as Melgounov: http://www.paulbogdanor.com/…/soviet/redterrorinrussia.pdf , Maximoff https://www.amazon.co.uk/s/ref=dp_byline_sr_ebooks_1… , Richard Pipes https://www.amazon.co.uk/Russ…/dp/0679736603/ref=sr_1_2… , and others. Why not refer to Marxist critics — fair critics — like Victor Serge, Sam Farber, Simon Pirani? The book would have been much better had it contained Erber’s original article (available via the AWL website), rather than dear old Sean’s interminable rabbiting about the left of today, saying nothing that he hasn’t done many times before, only at even greater length this time around. Secondly, bits of Shachtman’s article are omitted. And the appendices by Trotsky, etc, don’t add anything and are easily available elsewhere. But what I’ve noticed about Shachtman’s polemics, most notably his review of Isaac Deutscher’s Prophet Armed, is that — as Andrew noted — he offers a classic Trotskyist prettified view of Bolshevism in power. In that book, Deutscher looks very carefully at the decline of soviet democracy, the rise of political monopoly, the substitution of party for class rule, etc, yet Shachtman ignores this in his review. Deutscher was not afraid of pointing out the problematic features of Bolshevism in power, and gives an analysis and explanation of them that is far deeper than anything else I’ve read from the Trotskyist tradition. That reluctance to probe these features hands the advantage to the Cold War brigade, with their crude teleological procession from What Is To Be Done? to the Gulag. The laugh is that Erber and Irving Howe shifted to Shachtman’s right but within a decade could watch Shachtman whizz rightwards past them. What about just saying that the Bolshevik coup of 1917 led to mass murder, poverty, starvation and misery on a scale never seen before or since since it led to the rise of Nazism. No Lenin, no Hitler. Yes in that book, though it’s not as forthright as it should have been, Deutscher made the obvious point that one political party, the Bolsheviks, monopolising power (or rather, with ‘non-party Bolsheviks) cannot create a functioning workers democracy the soviets, let alone in society as a whole.